Someone had cornered Talzadon with a weapon. "Hey! I know you!" he said as he leapt away from the point of a spear. He raised his candle to illuminate the face of his follower. "You’re the guard from before! Why are you following me?" The pink Draik lowered her weapon. "Skarl’s advisors didn’t trust you. They said you may be a poor mage, but you aren’t a fool. They knew if you were coming down here that you had something to gain from it. They sent me to make sure you didn’t loot the artifacts of Old Meridell by grabbing them and teleporting to the rubbish dump or something. But I can see you likely have other intentions." She jabbed the parchment Talzadon was clenching with the end of her spear. Realizing he’d been caught, Talzadon fessed up. "I really am here for the Whispering Wail Sword. It’s real, and I have a map that leads straight too it, see, look for yourself." He angled his wrinkled map towards the guard, who studied it incredulously. "Where did you get that?" she replied. Her tone didn’t reveal much about whether or not she believed him. "When Fearieland fell, as buildings crumbled and the clouds came tumbling down to the Neopian earth, many millions of books, papers, and records fell. A few hundred landed on my own farm. Clearly the documents that landed were from a secret library. Many were partially burned, or otherwise destroyed. This sheet however, fell completely intact. It details the dungeons of the buried castles, and marks the location of the Whispering Wail Sword." "How could you possibly know that this is a real, accurate map. How are you so sure of this that you would risk your life following it? It could be completely made up for all you know!" This time Talzadon could tell she was hoping the map was real. "A few days after the papers fell, a team of uniformed faerie Neopets came and started picking up every single scrap of paper. They checked each one, and I heard them say ‘Who knows if the map even fell here?’ If this wasn’t a real map, why would they send people to look for it?" The guard studied the page again. She could see the map of the first castle was accurate so far, but that didn’t prove anything. "I’m assigned to follow you in either case," she said, "so I just hope this doesn’t turn out to be a boring twenty mile walk with the laughing stock of Meridell. Might as well keep moving." She headed for the enormous door before them, and slowly pushed it open. Talzodon stuffed the map into the folds of his robes and sprinted to catch up to the guard. "Hey! What’s your name anyway?" Beyond the great door her voice replied, echoing from a distant corridor "Lady Mina, Knight Second Class." Talzadon caught up to her in what he presumed was once the barracks. Moth-eaten sheets covered rows of straw mattresses, bunked three high. He had to tear through thick matts of cobweb to reach her. With every step a cloud of dust, dirt, and perhaps ash lifted up behind him. "How did you know this is where we needed to go?" he asked. "Easy," Mina started. 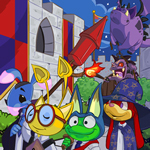 "The layout of the first two castles is known to all Neopets working in castle security. I’ve actually been down here before, but not any further than the entrance to the second castle. She approached a trapdoor in the ground and yanked upward on the metallic ring that functioned as a handle. Once the dust cleared a narrow chute revealed itself. It was a tight fit for Talzadon, but he managed to climb in and slide down the winding, damp chute, arriving at what seemed to him to be the inner portion of a battlement. They must have arrived at the top of the second castle. Mina soon followed out of the chute. "We should probably stop here for food," she said. From beneath her tunic she retrieved a parcel identical to the one she had given Talzadon. Inside there was a meager portion of bread, a half-rotten apple, and a jerky of some kind. Talzadon didn’t find the meal very appetizing, and sat down on the cold stone floor without opening his parcel. Between bites Mina asked a shy question. "So, just what does this sword do? What powers does it have that it could end the famine?" "Well, I’ve only heard legends of its power. Supposedly long ago it was just a regular sword, used by one of the nights of Old Meridell. One day a powerful and evil spirit casted an eternal night upon Meridell. The knight who owned the sword vowed to restore the light. He first traveled to Fearieland, where a light Fearie coated his sword with faerie dust. The knight returned to Meridell and found the evil spirit hiding in a pitch-black cave. His sword now glowed with the power of the light Fearie and it guided him through the darkness to his nemesis. Upon finding the spirit he slashed at it with his sword, but the instant the blade touched the spirit, an enormous light filled the room. The spirit screamed and was sucked right into the sword, trapping him there for all of eternity. The sword now glowed with the powers of the light Fearie and the powers of the unnamed dark spirit. The magic inside became neutral, and could be used for either good or evil. Many evil Neopians tried to steal the sword to wreak havoc on the land, but the knights of Meridell kept it safe. At least until the first castle sunk. The sword could not be retrieved in time, and legend has it that it still rests in a secret armory below the original castle." "Wow. That’s some story," said Mina. "I hope it really is down here somewhere. The castle meals are becoming less and less appetizing as we run out of food." She tossed the rotten half of her apple to the side and stood up. "Even if we found it, how would someone harness the power to restore fruit to our land?" "I have heard from other mages that a powerful Neopian can cast any spell with the sword simply by holding it. I imagine all I’ll have to do is drive it into the soil while casting a spell for good crop growth," replied Talzadon. "Ha!" You?? You think you are the powerful Neopian Skarl will entrust with the Whispering Wail Sword? You must be delusional. Come on, best we keep moving," she said as she pulled Talzadon down the spiral staircase to the main castle. "Hey, why do they call it that anyway?" she said. "The Whispering Wail Sword. It sounds cool but what does it mean?" "Supposedly, the sword whispers and wails. Legend has it that you can always hear a faint wailing emanating from the sword. It’s the cries of the evil spirit, desperate to get out of his prison. Whoever holds the swords hears the whispers. The voice of the light Fearie can be heard encouraging heroes to remain righteous, while the voice of the evil spirit calls for the hero to turn to darkness. But, I don’t know if I believe that part. It’s been thousands of years since anyone has ever seen the sword. A lot of stories get made up and twisted in that time. Even if all the legends are false, I firmly believe the sword exists and that it is filled with the power needed to save Meridell." "I surely hope so," Mina replied. The two reached the bottom of the stairwell. They found themselves in the main hallway of the second castle. The decorations seemed more simplistic, but no less old or dirty. Rough paintings of old kings lined the hall, but the paint was chipped and damaged. The names of the kings were printed below each portrait, but in a script neither Talzaon nor Mina could read or even recognize. It was as if they had traveled a thousand years to the past. The walls had an almost barbaric look to them. A rack of weapons lined each hall, ready to be put to use in a time of war. They passed through a door opposite of the stairwell and found themselves in what looked like an old kitchen. There were fireplaces and barrels, but everything was all over the place. Talzadon supposed they had been displaced during the Great Splashing, when the castle was flooded and washed underground into a massive sink hole that had opened up. Talzadon opened his map. He could see where he was in the kitchen, and it appeared they would have to crawl through the castles sewer system to find the entrance into the next castle down. The entrance to the sewers looked like it was nearby. Slightly disgusted, he folded the map back into his robe and called out for Mina, who had slipped into another room somewhere. "Mina! Let’s get going!" But he heard no reply. "Mina?" he called again. "Miiiiinnnnnaaaaaaa!" he yelled as he stepped back into the hall to look for her.